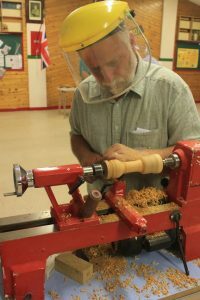 and since has been the local woodturning club for Herefordshire, accepting all. Within the group we have years of experience in all aspects of woodturning, everyone’s a beginner at some point! The group loves to learn, we all have individual skills and love to share these with each other. We all have the common interest in woodturning making it easy to meet new people and socialise within the group. For the meet in April 2019 we will meet at Headway Center in Credenhill. If you’re not sure about anything then feel free to get in touch and we’ll get back to you.